AAA Septic Pumping in Manteca, CA is your first choice for septic tank pumping, septic tank installations and septic pump inspections, as well as grease trap pumping, at the lowest rates in the industry, in the Manteca & surrounding areas. 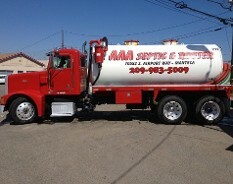 AAA Septic Pumping Inc. provides premium septic tank pumping, cleaning and inspections for Manteca, California and the surrounding communities. Make certain your home or restaurant is safe for everyone and the environment with a quality septic service from AAA Septic Pumping Inc. Qaulity service you can believe in for your Septic Tank & Grease Trap Service needs. As an owner-operated and state-licensed septic service, we’re able to provide exceptional work that improves the convenience of your home or restaurant. Everything we do is backed by more than 20 years of combined experience and our great reputation for personalized assistance to homeowners for septic tank pumping & repair and restaurant owners & commercial accounts for grease trap pumping services.